Digestion problems are not just uncomfortable, painful, and embarrassing, they are also fairly common. Many people struggle with disorders of the digestive tract, including those that cause discomfort and inflammation like irritable bowel syndrome, Crohn’s disease, celiac disease, acid reflux, ulcers, and just plain old indigestion with no particular diagnosis. Rather than attacking your discomfort with drugs and medications that can cause side effects and may not even work, consider a natural approach. There are many ingredients that you can include in your daily smoothies that will help to soothe your irritated digestive tract. Even without special stomach-smoothing ingredients, smoothies are a great way to get your nutrients if you have a digestive disorder. When you eat solid foods, your digestive tract has to work hard to get all the pieces broken down and to extract the vitamins, minerals, and other nutrients. When you consume a smoothie, on the other hand, you are giving your digestive system a break. It is as if you have done part of the work already. Smoothies are also great for their size. When you struggle to digest your food without pain and discomfort, it is best to eat several small meals per day. A couple of big meals can really tax your stomach and intestines. Smoothies are perfect as small, frequent meals throughout the day. If you struggle with digestive issues that cause irritation and discomfort, consider using demulcents in your smoothies. Demulcents are ingredients that create a film over mucous membranes. The mucous membrane is the lining that covers the interior parts of your body that communicate with the outside world. It produces mucus which protects your cells. For instance, the inside of your nose is lined with a mucous membrane that protects the skin cells inside your nose. Your entire digestive tract is covered with a mucous membrane. Your digestive disorder can disrupt it and cause irritation. When you consume demulcents, they create a film that covers the mucous membrane and has a soothing effect. Essentially, demulcents do the protective work of the mucous membrane when it fails. Demulcents are sometimes called mucoprotective agents for this reason. Plants that are demulcents produce a type of carbohydrate called mucilage. It is this compound that is responsible for creating the film that soothes the mucous membrane. You can tell quickly if an herb is a demulcent by crushing it and adding a little water. If you rub it between your fingers and it feels slimy, then you have a demulcent. Other demulcents, besides herbs, have long been used in cough syrups for the soothing effect on the throat. Things like syrup, honey, pectin, and glycerin are common in both store-bought and natural cough syrups for their mucoprotective effects. Add demulcents to your daily smoothies to help soothe your irritated stomach and intestines. These ingredients are easy to find in health stores, but can also be found online. Some, you may even be able to get from your local grocery store. It is important, however, that you discuss any new supplements or herbs with your doctor before you try them. Your doctor can tell you if a particular herb might interact with a medication you take or affect an illness that you have. The chia seed is a superfood that was once relied upon by the ancient Aztecs as a source of energy. Today, chia seeds are a great addition to smoothies for several reasons. They are high in fiber, which help to keep you full if you are trying to lose or maintain weight. They are packed with omega-3 fatty acids, and unlike flax seeds, do not need to be ground up to get to them. If you have already used chia seeds, or you had a chia pet as a kid, you know that when you put them in water, they form a slimy mixture. This is how they help to fill you up without providing too many calories, but is also what makes this food a demulcent. That slimy gel will coat your stomach and intestines and bring you some relief from your inflammatory bowel condition. To make chia seed gel, combine 1 part chia seed to 1 part water in a small container and let sit for 15-20 minutes. Refrigerate afterwards for use in smoothies for the next several weeks. For the full download on chia seeds, click here to read my article. 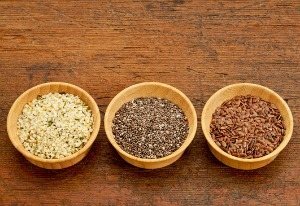 Like chia seeds, hemp and flax seeds are demulcents and will absorb water to create a gel that soothes your stomach. They may not create quite as powerful a gel as chia, but if you want to try new ingredients and new flavors, these two are worth a try. For instance, if you need more protein in your diet, hemp seeds are a great choice. Just make sure you grind your flax seeds in a spice grinder before using them. To learn more about hemp, check out my post, hemp health benefits and superfood smoothies. Aloe vera is a versatile and common houseplant that you can actually eat. If you have ever cut open a leaf of aloe, you will have noticed the gel that oozes out of it. That gel acts as a demulcent and is an excellent ingredient for smoothies. The best way to get the gel is to either grow your own aloe vera plant, or buy the leaves from your local health food or grocery store. Cut the skin away, and the interior is the gel you want to include in your next smoothie for stomach soothing. Purchasing aloe vera gel is another option, which I’ve actually found is a bit more convenient to work with. For more info, see my article on the awesomeness of aloe. Irish moss may be a landscaping element, but when listed as a gel is a stomach-smoothing demulcent. Irish moss gel is actually a type of seaweed, and is completely different from the actual moss that may grow in your yard. In cooking, health food enthusiasts use this ingredient raw as a thickener and an emulsifying agent. Irish moss can thicken up your sauces because it is a demulcent. You can create your own Irish moss gel by purchasing the ingredient and then soaking it in water. About eight ounces in one and half cups of water works well. Soak for several hours and then mix it up in your blender to create a paste that you can store for a few weeks. Add some to your smoothies when your digestive issues are flaring up. For a great video on how to make Irish moss gel, click here. Don’t confuse this plant with the fluffy white marshmallows you put in your cocoa. Marshmallow is a plant and a demulcent. Also referred to as just mallow, this herb has been used for centuries as a treatment for just about everything. It has been used for urinary problems, to relieve symptoms of colds and the flu, and to treat wounds, scrapes, and burns. Mallow has also long been used to relieve inflammatory digestive issues like ulcers and other concerns. You can easily add mallow to smoothies if you find a good prepared version. In health stores and online, you will most likely find it as a powder, but you can also find liquid extracts. Follow the suggested dosing. Another potent demulcent, this mucilaginous herb is very soothing to the entire digestive system. It also helps absorb toxins in the bowel, regulates intestinal flora, is known for providing relief from diarrhea, and is quite nutritious. Slippery elm bark powder has a slightly sweet, almost nutty flavor. It blends well in smoothies and when ground into a fine powder can be used as a flour extender in a variety of recipes. Long used in Eastern medicine, the root of the licorice plant is a potent demulcent. One of the most common uses for it is to soothe a sore throat, but it can also soothe your digestive tract. You can buy licorice root powder from most health food stores and online. It has a sweet and distinctive flavor, so you may need to experiment before coming up with the perfect smoothie recipe for it. Licorice is a medicinal herb, and you should definitely speak to your doctor before trying it. There are some medications that will interact negatively with licorice root and if you have certain conditions you should not use it. The demulcents listed here largely have mild flavors that will blend into your smoothie recipes or no noticeable flavor at all, with licorice as an exception. Try adding any of these ingredients to your favorite smoothies and experiment. My favorite demulcent is chia seed gel, which makes its way into a large number of my smoothies. Here’s a basic stomach soothing smoothie recipe. Place the ingredients into your high-speed blender and blend for around 30-45 seconds or until nice and smooth. You can also experiment with demulcents in other recipes. For example, chia seed makes a great pudding and slippery elm powder can be mixed into cereals, applesauce, or fruit juice. For any herbal ingredient or prepared ingredient, such as a powder, tincture, or extract, follow dosing instructions as described on the packaging and never use more than is suggested. If you are ever unsure about the safety of an ingredient, talk to your doctor first. What’s your experience with stomach soothing foods or demulcents? Any that you’ve found great relief from? Please share your wisdom in the comments below. The way you present information is always so clear and flowing; and the subject matter, always very interesting and applicable. Looking forward to including more demulcents in my diet! I came across your website while searching for smoothie recipes, I’m so glad I found this! Thank you for such great, insightful, and informative advice and recipes. Do you recommend people with GERD to drink smoothies as part of a regular and healthy diet? Wow – I am definitely going to try this – have suffered with IBS for years – fingers crossed! same here…i suffered with ibs all my life,,,finally tried this out and my tummy feels finally comfortable,,,what a relieve!!! How much of this and how regularly are you drinking this for relief of your symptoms? Hey ryan..im from india..My search for yummy smoothie recipes finally comes to an end..im soo glad i found your website..everything is soo clear..informative and well placed at the same time..was reading the benefits of spirulina and im really keen on adding it to my diet..the issue here is that spirulina is not easily available in India..is there any other superfood that i can substitute it with which is equally nutritious? I’m just as happy to have you around Healthy Smoothie HQ and are finding the content clear and informative. The only other superfood that really compares to spirulina is chlorella, but I’m guessing that’s hard to come by in India too. There are several Ayurvedic herbs worth exploring that are also very nutritious: Amla, Ashwagandha, Holy Basil, and Shilajit. Try the Stomach Soothing Smoothie in the post above with a whole banana and without the avocado if he doesn’t like it. Start with a little less aloe vera gel as well. Make sure it tastes good first, then increase the aloe. This is a brilliant recipe for someone like me with fermenting gut syndrome. The only drawback is the honey, I’ve been told it is still sugar and therefore bad for the stomach – can you give us your opinion on this? I’m not that familiar with fermenting gut syndrome, but suspect it may be similar to candida in that all sugar is bad? If true, then I would substitute stevia for the honey. Raw, local, organic honey is a true superfood that is extremely nutritive and healing when used in moderation. Hi Ryan. Your smoothies are wonderful. Thanks so much. In order to use slippery elm powder in a smoothie should I make angel first by putting it in water? Or just sprinkle the dry powder into the smoothie? You can go ahead and sprinkle the dry powder right into your smoothies. Awesome site!! I have an allergy to bananas and was wondering what I should use instead of it here, a whole avocado? Thanks, Annmarie :) Try 1/2 avocado. Cheers! SIBO is a tricky one. I would check out the GAPS and SCD diet for this. If I ever create a smoothie to help with SIBO I’ll be sure to let you know. My 11 yr old son was vomiting for 12 days…in and out of emergency room & hospital. He was referred to specialist & admitted into hospital again. (For dehydration & to determine cause of vomiting) the GI specialist did a scope & only thing they found was inflamed stomach. (Biopsies aren’t back yet) my son is very athletic so he’s already very thin..he’s always been healthy until he got this nasty stomach virus & lost 10 pounds. The GI doctors wanted to have him drink Ensure for nutrition but he hates it. He loves smoothies but hospital smoothies are horrible..he might get released today from hospital if he can keep down the hospital smoothies and Carnation Instant Breakfast drink..doctors prescribed his medicine to help his stomach they also recommended smoothies when hes home do you have smoothies recipes to help his inflamed stomach & to help him gain his weight & muscle back ? would you recommend a certain drink thats not acidic but a good way to control the IBS and still have my nutrients. most things irritate me now tbh and im limited on what i can eat and afford to eat and eat what i can afford tbh. but i need a more stable food intake. Bone broth, bone broth smoothies, and the recipes in this article are what I recommend. Healthy cooking oils: coconut oil, palm oil, ghee, lard, tallow, and bacon fat are all excellent. So pleased I found this web site – the smoothie recipe is great and really helps! I’ve been having the smoothie for breakfast, but by evening time I get a lot of pain and discomfort again. Would you recommend taking a little of the smoothie before each (small) meal? I have only just started using the smoothie so maybe I need to try a bit longer. I recommend this smoothie on an empty stomach. Maybe have a little before or after meals. Hi Roz. I have had IBS for years. Pain and discomfort was part of my everyday life. Start taking activated charcoal before your meals in the afternoon and evening. It absorbs all the nasty toxins and gasses, thus your intestines get a chance to heal. After many years of using charcoal, I was basically cured from IBS. Just don’t revert back to the old nasty eating habits when you find your intestines are healed after a couple of years on charcoal. My Dr told me to look up smoothies for inflammation, detox and energy…I came across your site…I will try the inflammation smoothie you posted…I am recovering from Shingles and am wondering if it could be that virus affecting my bowels..
For the last 3 weeks I have had major issues in that area…I am gluten free, no dairy, no sugar, no flour…Imodium is a temporary fix…any suggestions? Could not find the answer. Does a smoothie help increase sodium levels? I don’t see the link for the free smoothie recipe book. thank you. I am new to smoothies and you have some recipes that look great,thank you.